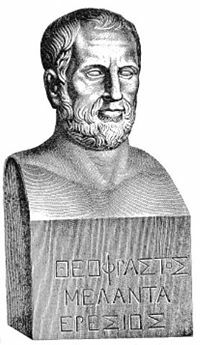 Theophrastus was wrote a great number of books on a wide variety of topics, including logic, metaphysics, natural science, medicine, politics, epistemology, rhetoric, and ethics. Most of his works have been lost, but those that remain have had a continuing influence on western thought. His explanation of Aristotle’s ideas on the human intellect was studied by scholars during the Middle Ages. His work On the Senses contained summaries of the ideas of earlier philosophers and is thought to be an important source for later doxographers. The Characters, a set of sketches of human peculiarities, gives a precious insight into life in ancient Greece, and several modern writers have emulated its style and format. 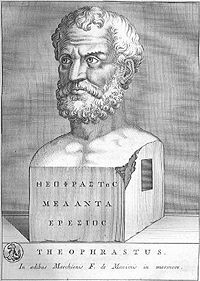 Theophrastus was born at Eressos in Lesbos c. 372 B.C.E. Diogenes Laertius’ Lives of Eminent Philosophers says his father was Melantas; other sources says he was the son of Messapus and Argiope. His given name was Tyrtanius, but was changed by Aristotle to Theophrastus, meaning “from the divine character of his eloquence” (Diogenes Laertius). He first studied under Leucippus in Lesbos, then, after attending Plato’s lectures, became a pupil of Aristotle. Aristotle appointed him his successor as leader of the Lyceum when he moved to Chalcis around 313 B.C.E.. In his will, Aristotle made him guardian of his children and bequeathed to him his library and the originals of his works. Theophrastus presided over the Peripatetic school for 35 years. Under his guidance the school flourished, and had at one period more than two thousand students. He was received as a friend by three kings, Philip, Cassander, and Ptolemy I Soter. One of his pupils was the comic poet Menander. Diogenes describes him as “a most benevolent man, and very affable.” He was highly respected by the people of Athens and was quickly cleared of charges when Agonides attempted to impeach him on grounds of “impiety.” He was forced into exile for a short time, along with other philosophers, when Sophocles passed a law that no one could preside over a school without approval by a resolution of the council and the people of Athens. The Athenians quickly overturned this law and allowed Theophrastus to return. Theophrastus died at the age of 85, shortly after retiring from public life. In his will, he left his house and garden to the Lyceum as a permanent seat of instruction. He was given a public funeral, and the Athenians “accompanied him to the grave, on foot, with the whole population of the city, as it is related, honoring the man greatly” (Diogenes Laertius). His dying words were a lament that human life was too short, ending just when one was beginning to understand it. He told his disciples to “remember that life holds out many pleasing deceits to us by the vanity of glory; for that when we are beginning to live, then we are dying. There is, therefore, nothing more profitless than ambition. But may you all be fortunate, and either abandon philosophy (for it is a great labor), or else cling to it diligently, for then the credit of it is great; but the vanities of life exceed the advantage of it” (Diogenes Laertius). Diogenes Laertius lists a large number of books written by Theophrastus on a wide variety of subjects, totaling 232,908 lines of text. The only complete works still existing today are two large works on botany, A History of Plants and Reasons for Vegetable Growth, and The Characters. We also possess in fragments a History of Physics, a treatise entitled On Stones, a work called On Sensation, and certain metaphysical Airopta. Theophrastus shared Aristotle’s fascination with the natural world, and conducted a number of experiments and explorations. Among the books (now lost) listed by Diogenes are titles such as Description of the World; Salt, Nitre and Alum; the Astronomical System of Democritus; Difference of the Voices of Similar Animals; Animals Which Bite and Sting; Animals Which Live on Dry Land; Animals Which Live in Holes; Animals Which Change Their Color; Hot and Cold; Stones; Mines; Fainting Fits; Wine and Oil; Sight; Perspiration; Paralysis; Suffocation; Concretion and Liquefaction; Self-Produced Animals; The Sea; Meteors; Fruits; History of Geometry; Aristotle on Animals; History of Astronomy; Crater of Mt. Etna; and twenty-nine books on Natural History. He conducted the first recorded experiment to show that the Mediterranean Sea was formed by the inflowing Atlantic Ocean by releasing a message in a bottle. In 314 B.C.E. he noted that the mineral tourmaline becomes charged when it is heated, the first known reference to pyroelectricity. Theophrastus inherited Aristotle’s works on botany and continued to expand them. In Athens he was in charge of the first botanical garden. Two of his works De historia plantarum (“A History of Plants”) and De causis plantarum (“About the Reasons of Vegetable Growth”) are in existence today, probably because Pope Nicholas V ordered them translated into Latin in the middle of the fifteenth century. For several centuries they became an indispensable guideline for the teaching and understanding of botany. These works were of a general nature, only casually referring to specific species of plants. Theophrastus also recorded what he knew of the foreign species of India, Persia, Bactria, Syria, Egypt and Libya. A History of Plants consists of nine books (originally ten) discussing plant anatomy, trees, germination of seeds, the difference between wild and cultivated trees, perennials, wild and cultivated vegetables, cereals, and saps and medicine. Reasons of Vegetable Growth consists of six books (originally eight) discussing the growth and propagation of plants; the effect of environmental changes on the growth of plants; how various types of cultivation affect plants; propagation of cereals; artificial and unnatural influences on plants; plant disease and death; and the odor and taste of plants. The Characters consists of brief, vigorous and trenchant delineations of moral types, which contain a most valuable picture of the life of his time. They form the first recorded attempt at systematic character writing. Some have regarded the book as an independent work; others incline to the view that the sketches were written from time to time by Theophrastus, and collected and edited after his death; others, again, regard The Characters as part of a larger systematic work, but the style of the book is against this. Theophrastus has found many imitators in this kind of writing, notably Hall (1608), Sir Thomas Overbury (1614–1616), Bishop Earle (1628) and Jean de La Bruyère (1688), who also translated The Characters. De causis plantarum: in three volumes. Cambridge, MA: Harvard University Press, 1976-1990. Enquiry into plants and minor works on odours and weather signs. Arthur Hort, transl. New York: G.P. Putnam's Sons, 1916. On the Senses, Theophrastus and the Greek Physiological Psychology Before Aristotle. G. M. Stratton, transl. London: Allen & Unwin, 1917. Theophrastus’ Characters, Rusten et al, transl. Cambridge, MA: Harvard University Press, 1993. Theophrastus: Characters (Cambridge Classical Texts and Commentaries). James Diggle et al, transl. Cambridge: Cambridge University Press, 2004. Theophrastus: Enquiry into Plants Books I-V. Cambridge, MA: Harvard University Press, 1916. Theophrastus: Enquiry into Plants Books VI-IX: Treatise on Odours, Concerning Weather Signs. Cambridge, MA: Harvard University Press, 1916. Theophrastus: the character sketches. Warren Anderson, transl. Kent, OH: Kent State University Press, 1970. This page was last modified on 24 November 2015, at 21:21.